Either way, WTI trading at around $65 a barrel would be better for me. I know there are modular small CNG plants that can be used to capture stranded gas and then transport to pipelines or local end users. The acid test of course is whether these are viable in a low gas price environment. In principle though I agree - its shocking that so much gas is being flared off. I presume re-injection is not feasible as these are coming from fracked rather than conventional gas fields? Most gas that is flared is from an oil well and isn't enough MCF to build a pipeline. LNG? Don't even understand how this is supposed to work. There are lot's of reasons for flaring gas from an oil well. Most of the shale wells produce large amounts of NGLs because the oil in the shale is actually in gas form but condenses on the way up the wellbore. What doesn't condense comes out as gas. The flow has to be adjusted and controlled during the first months of production and in that case, flaring gas at times is necessary if too much gas comes up at once and overwhelms the separator causing backpressure (this can happen anytime but is less of an issue in a mature well). There are separators on each well that split the water, oil and gas. If there are no pipelines for the gas, it all has to be flared. The Texas RRC doesn't allow flaring of gas but will give permits on a per well basis for flaring a certain amount of production. Right now in the Permian there is a lot of flaring because of a lack of processing capacity and pipeline takeaway. Building out the infrastructure is taking longer than producing more oil and unfortunately the RRC hasn't seen fit to establish allowables on the new fields that would limit production. They could do that but the RRC is always on the side of the producers as opposed to the landowners or what is best for the public interest. They define public interest as what's best for producers and of course low prices aren't good for producers and that is what they were established to regulate. Ostensibly they are also in place to keep the natural resources from being wasted but the current amount of flaring is probably something they should be addressing on that basis. Not sure how they will without impacting production and boy will you hear a howl if/when that happens. I have three sections in West Texas producing oil and gas from the Wolfcamp. These sections have been in my family for 110 years and my sister and I have been managing them for about 20 years now. Unfortunately two of the three had bad leases our ancestors signed back in 1950 and 1970. The deep rights were stripped off the leases and sold long ago. The shallow stripper wells held the entire section for all of the minerals at all depths because the old producer 88 leases were totally in favor of the producers. The modern lease we signed in 2010 on the third section requires we are paid a 25% royalty on all flared gas. That is a penalty to the operator for flaring. We also had a Pugh Clause that forced the operator to sign a second lease with us just this month in order to exploit the resources at the next lower horizon, Wolfcamp B. That is a very gassy strata and this operator has 120mmcf worth of processing facilities on the section next to ours and into which much of his production is routed. However, he has connections to two other pipelines that he can put gas into so he doesn't flare much. The gas has to be processed in order to remove the liquids and reduce the BTU content to between 1000 and 1100 BTU/mcf in order to meet NG pipeline tariffs. Typically the gas coming up from these wells is 1300 to 1500 BTU/mcf because it's laden with larger hydrocarbon structures i.e. ethane, propane, butane and natural gasoline. Those products are stripped out and sold to add value to the NG stream. It's not true that these wells can make money on the oil alone at current prices, it does take the NG component to keep them profitable at current prices and for that reason I am fairly distressed at the overproduction out there. In the case of our two sections out there which are under the old producer 88 leases, XTO has developed one and the other was developed by BHP. Both companies invested in substantial infrastructure via tank batteries and compressors. They both put in pipeline takeaway capacity for the gas but neither has any local processing. XTO spent $60m last year drilling and completing 7 new wells on it's section and we have yet to know what the production is but the expectation is 4000 to 5000 bbl/day oil which is also about 10-12mmcf gas per day. I was out there in December before they started flowing so I don't know how much they are flaring currently but we don't get paid on flared gas with that lease. From a landowner point of view, I don't like flaring because it's a loss of resource that I am allowing them to develop and for which I am not being paid. Unfortunately, due to the existence of stripper operators and a bad lease, I am helpless to stop it. I do appreciate the issues involved here and I think the flaring will be reduced as more infrastructure is completed. 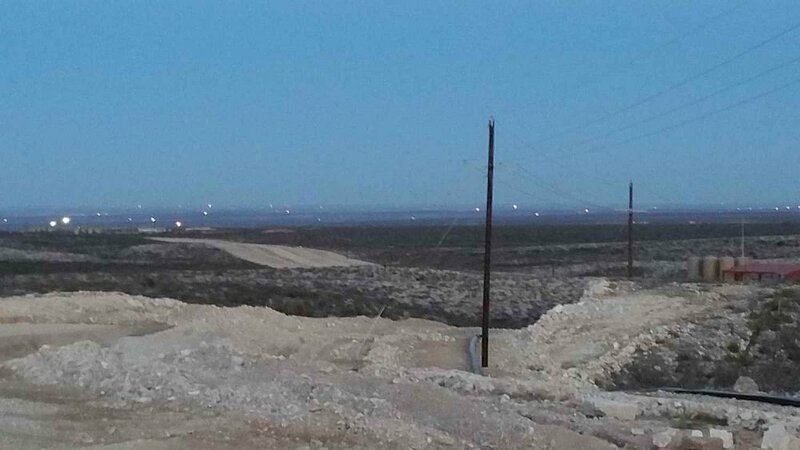 Here is a dusk picture of some flaring out in Reeves County taken from Culberson county looking east. Thank-you, WRS, for your detailed information and thank-you for explaining how some lease structures can discourage wasting a valuable resource. You don't need a pipeline. It can be processed onsite with a mini-processing plant. It can then be compressed or liquified and shipped via truck or used onsite to run equipment. You don't need a pipeline, you can use the gas onsite to run trucks and drilling equipment. You can truck it to a pipeline or wholesaler. What makes our oil sands less efficient is that we burn gas to produce steam to free up the oil. Basically we are cleaning up a huge natural oil spill. The fact that the Permian is flaring more gas than we burn for the steam makes our oil sands much cleaner than those shale areas. Do you get much backlash for the dirty oil? Or do the environmentalists not add things together? There are separators on each well that split the water, oil and gas. If there are no pipelines for the gas, it all has to be flared. The Texas RRC doesn't allow flaring of gas but will give permits on a per well basis for flaring a certain amount of production. Right now in the Permian there is a lot of flaring because of a lack of processing capacity and pipeline takeaway﻿. That is the whole issue, new shale drilled wells will flare an amount for a time. In most cases it's not feasible to capture the by product of these wells. They aren't gas wells and skunky gas burps a lot on the new shale wells. The solution, flare it. It's a by-product and not worth the amount of money to salvage. Soon enough the wells will produce less and less of the flared gas and wells will be closed in to the pipeline. If you can't get rid of the by-product by pipeline, compressing and liquifying and trucking out would by catastrophic loss of revenue. The product isn't worth squat, and building a fleet of trucks and portable compressor stations?? Loss of revenue. Hence, FLARES!!! Here in the Permian Fast Food burger chains pay 13.50 hour to start. Because the oil field is it's own economy. I do understand what much of you folks are saying but the truth of the matter is it just not cost effective to even put it back in the ground it came from. Rant over. I discussed the topic of capturing gas and producing it into electricity with Jan recently in another thread that Tom opened. I work in the west Texas and SE New Mexico oil patch and saw the waste that is flaring long ago. To date, no one has come up with a solution to this problem that is attractive to the people that control the money necessary to alleviate this problem. If well-gas powered engines with gensets were an attractive option then their use would be widespread RIGHT NOW. They are not because the engines and maint. costs are higher than the energy produced into the grid. There is something wrong here. I am not a rocket scientist and I can see the huge waste and find it disgusting. LNG is a world wide market and is the only solution I see to the problem of flaring/wasting well gas. As demand for American gas via LNG rises, we should see a corresponding rise in the price for gas at the all-important Henry Hub. This alone should be the stimulus that will eventually provide the funding for the construction of the gathering lines needed to get the gas to the new pipelines that are supposed to come online by the end of 2019. 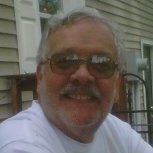 I believe that as the US LNG industry matures we will see LNG exports increase and we will see gas prices increase to the point where gathering lines will be built and flares will be a thing of the past. Don't get me wrong, there will always be flares from newly produced wells that do not yet have their corresponding gathering lines constructed but the days of widespread huge flares should soon be a thing of the past.....or so I hope. I am placing my hope in the market discovering that it is more profitable to gather all this gas and ship it to the LNG plants than to piss it away into the atmosphere! Sounds like you are making an important argument. Do you have a reference? You should at least be incinerating it rather than flaring it if you folks have any environmental conscience at all. Flare efficiency 65% -Incinerator 98%, The methane is way worse than CO2. I for one and speak only for myself, I don't worry too much emissions from flares. I don't buy into the world is going to be destroyed in 12 years, much less in the next 50 years. The methane from dairy and hog farms, and feed lots produce an amount that rival the swamps in Florida, the pools in Yellowstone also...… and lets not forget volcanoes currently erupting in Hawaii. The earth constantly is changing and will continue to do so. To put it bluntly, I am not an environmentalist freak. There is a simple solution. No flaring is allowed. Drillers will build infrastructure first and if the cost is to high they will have to wait for higher prices in the market to justify drilling. If I'm not mistaken Alberta is Canada's largest area for reserves of tar sands which produce over 1/2 of crude bitumum. A product of extremely heavy crude which has large discount from pricing to WTI and is a refined product for asphalt which is not very environmentally sound. If you are from Calgary I wouldn't be throwing any stones about flared gas at the drillsite. By the way, the flaring takes place while completion of the well is happening so when it the wellhead is placed the flaring stops. That isn't a simple solution. No flares? You have no concept of the oilpatch. Drillers haven't the say in infrastructure, the folks that hired the drilling company may to a degree, but investors are the driving force. Blame it on greed if ya want. If your a green activist, design a machine that will cover the cost of it and the infrastructure and make a viable argument. In Alberta it was made illegal to flare about 10 years back. Yes they still exist but they are rare. You are flaring a great amount of gas in the Permian-it would be interesting to do the calculation on which is actually the dirtiest oil. In Alberta, when we regulated the flares out-there were numerous gas turbine generation packages that went in to generate power from the stranded gas. It is a great application for old gen sets. But you have to have the power grid willing to take the power and the electrical infrastructure set up. These https://www.clarke-energy.com/gas-engines/type-3-gas-engines/ are the type of gas gensets to use. Low maintenance, very reliable. It is total BS that generating electricity does not pay because "maintenance cost is too high". 2) the producer is charged a penalty for each mcf of flared gas. Think people would figure a solution if they weee charged say a monthly average of the NYMEX for flaring. Flaring is a waste; it really does not matter, or might not matter to our grandchildren, how much of it there is now. What matters is how much of it there will be. It can't be doing anything good to the air above us and, of course, wasting gas from depletion driven shale containers exponentially increases liquids decline. Flaring is on the increase in the Eagle Ford also, as well as the Bakken. We know its about a BCF in West Texas and maybe another B from S. Texas and North Dakota. That's a lotta gas going up in smoke. @Ian Austin, great idea. We have to remember that these guys tout drillable locations in their investor presentations, and to the press, years and years of "drillable" locations. They are even able of book PUD reserves based on imaginable locations in proximity to PDP wells. But they can't have planned far enough ahead to have their market in place before they spud the well? Phfttttt. But your idea would fall under the permitting process at the TRRC and the TRRC is not interested in slowing anything down; not jobs, not tax revenue and certainly not votes for the three elected Commissioners. Besides, China needs the oil. So, when you consider that long term debt MUST be paid back for tens of thousands of shale oil wells that have already been drilled, the real "breakeven" oil prices is upwards of $90 per BO. We're exporting this $90 oil to China for about $38...no long term debt is getting paid down at current prices and only 20% of future drilling is self-financed thru cash flow (Haynes and Boone). All this to stimulate the Chinese economy. In other words, buddy; as messed up as Alberta's oil biz is, we got you beat here in the US by a mile. Good points. My dad always says “if they don’t make it a priority, make it one for them”. A little nudge goes a long way. I have not done the math but I have worked at SAGD facilities. They are really just a water treatment plant - separating the hot water from the oil and then cleaning up the water so it can be turned into steam again. Other than that it is just steaming the oil off the rocks. The only thing that makes it 'dirty' is that we need to burn some gas to make the steam - but if the Permian is flaring much gas - the oil sands are cleaner without having to have the decline curve get steeper and steeper. And without fracking. It appears that most of these 'tar sands' opponents really don't see what is actually happening.